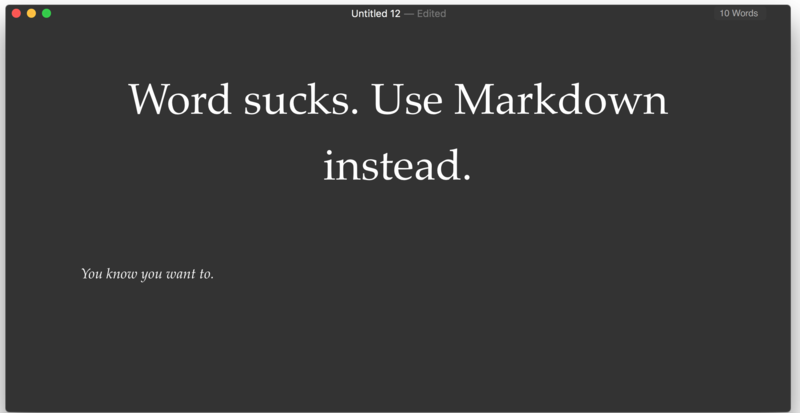 Markdown is not a piece of software. It’s a method of representing rich text (that is, text with formatting) in a plain text file. Markdown files can then be put through an interpreter which adds formatting to the text. The result are very small files that can be output to many different formats. Because Markdown is plain text, it only contains the text (and the syntax required to display it), rather than all of the XML files and various crap inside a .docx file. (Try opening one in 7zip or WinRAR, it’s a mess). That was just a simple example and if you want a more exhaustive guide, the creator John Gruber’s website is a good place to start (although, it might get a bit verbose). While some interpreters use different “dialects” of Markdown that might include more (or less) features, the Daring Fireball reference can be considered the golden standard. The most common variant, however, is the variant used on GitHub. If you know HTML (the language every web page is displayed in), you can also use it in a Markdown file and it should work fine. Though it defeats the purpose, it’s helpful for where there a features missing. Because markdown files are plain text, you don’t need specialised software to read it if you know the syntax. Obviously, it might be better to run a specialised piece of software but you can open up a bash prompt (on OS X, UNIX or Linux), run nano/vi/emacs, start typing. On Windows, you can open up a notepad.exe window and do the same. Then all you need to do is save the file as a .md file. If you’d prefer something WYSIWYG (what-you-see-is-what-you-get), Typora is in my opinion – the best Markdown editor. Most markdown editors split the screen in half with the syntax taking up one part of the screen and the final result on the other part. This is an incredibly distracting and inefficient way of writing a document (especially if the result screen doesn’t update in realtime), it seems that these packages intended for writing documentation for software developers (As stated before, Markdown is heavily used on Github which is used for software development). A lot of these packages also cost money. Typora, at least for now, is free and only displays what you actually need to see – your results. It can also be customised with a whole number of CSS themes that you can download off the internet – or you can easily make them yourself. Most packages (including Typora) can then export Markdown to common filetypes, including the ubiquitous PDF.